If you’re like most homeowners, you rarely lubricate your garage door. And if you’re like 27% of homeowners, you’ve never lubricated it. In never ceases to amaze us how many people choose to live with loud garage doors. If it sounds like you pushed a drumset down a set of stairs every time you open or close your garage door, you need to lubricate it. That sound isn’t normal. Not only will the noise be a constant source of annoyance for you and your family, but it will make your houseguests question your competence. After all, lubricating a garage door isn’t that hard. Also, the sound gives off the impression that you don’t take care of your house. So, if you’re trying to sell your home, you definitely need to get rid of that noise. In fact, a well-functioning garage door can actually add value to your home. And finally, that noise is more than just a noise. It’s indicative of real damage. That annoying noise you hear is the sound of metal smashing against metal. That can’t be good for your door, right? Right. A garage door is made up of a surprising number of parts, including tiny springs and hinges. These small parts aren’t designed to be rubbed up against each other without lubricant. So, when they are, they wear down quickly. If you’re the kind of person that would enjoy taking apart a big, complicated garage door made up of dozens of tiny spring and hinges, figuring out which ones need to be replaced, then maybe lubricating isn’t for you. Otherwise, we recommend you lubricate regularly. While fixing the damage caused by an unlubricated door might take days or weeks, lubricating it will only take a few minutes. First, clean the door’s tracks with a rag. Then spray the springs and hinges with a bit of lubricant (not too much, just enough so they don’t make noise). If your door has rollers, lubricate their bearings without getting lubricant on the wheels themselves. Make sure you use the proper lubricant and don’t use WD-40. Now that you know how important it is to use garage door lubricant, the next step is to actually start using it. So find a good lubricant and start now. Unfortunately, it may be too late for some of you. If that’s the case, look into our garage door repair services. If you have any other garage door related questions, don’t hesitate to contact us. Are you tired of pulling into the driveway and facing garage door issues that keep you even longer from your cozy couch and favorite Netflix show? If you’ve got a garage door problem that you can’t seem to figure out, there could be a simple solution. Lots of garage door problems can be fixed at home by yourself, without needing to hire a service person! Ready to do some garage door troubleshooting? Read on to find your problem and learn how to fix it! Garage door problems have you pulling your hair out? Keep reading to pinpoint the issue so you can get on the road to having a fully functional garage door in a hurry! Whether it’s with your remote control or via the wall unit switch, maybe your garage door opener simply isn’t budging. If that’s the case, a power interruption is likely the culprit. The solution could be as simple as plugging it back in. Check your outlet to be sure the opener unit is plugged into the wall. If everything looks good there, check your circuit breaker. It could be that a fuse or GFCI has burned out. Tip: Check to see if other garage lights are working. If they’re not, it’s likely a fuse issue, and you’ll need to replace it or simply reset the breaker. If everything looks hunky-dory and the garage door still won’t open, your opener motor unit might be defective or burnt out. At this point, you’ll need to have it replaced! There are a few potential issues here that could be causing your garage door to fall short of a complete close. First, it might be your close-limit switch. This switch is responsible for making sure your garage door doesn’t close on a person, and it’s required of all garage door opener units. Sometimes, though, the switch isn’t set correctly and needs some adjustment to make sure your door will close properly. Second, the motion sensors installed to ensure safety might need some calibration. These motion sensors are installed to be sure the garage door doesn’t trap anyone beneath it. Sometimes, they get out of whack and need to be realigned. There might simply be something in the way of the sensor, too. Check the ground to be sure no sneaky beach umbrellas have fallen in the path, making the sensors prevent the door from closing all the way! Finally, damaged or old rollers can prevent the garage door from opening and closing smoothly. This is a simple fix– all you need to do is replace the rollers or lubricate them to get the door to close right. There’s nothing more annoying than a garage door that works, but won’t open wide enough to actually fit your car inside of. Like a door that won’t close all the way, rusted or damaged rollers could be the culprit. Replace or lubricate them to get that door flowing smoothly again. Remember that, over time, rusty rollers can lead to rusted and bent tracks that are a harder fix to deal with! If the rollers appear fine, you might need to check out the up-limit switch’s location. This switch tells the motor when to stop, and if it’s located too far away from the opener unit, it’ll stop before you want it to. If you notice that this switch isn’t close enough to the motor unit, simply relocate it. That should solve the problem, and if not, the motor unit might be faulty. Contact a service person to diagnose it! Done your garage door troubleshooting and found the fix you need? Or maybe you’re still puzzled over the garage door issues you’re faced with? Either way, get in touch with us. We love to talk shop, and can help you with whatever garage door worry you’ve got! Are you trying to pick the perfect shade for your garage door? Choosing garage door colors isn’t a small decision. It can have a huge impact on the overall look of your home. There are a few things to take into consideration before you make the big decision. Once you know what’s important, what to shoot for, and what to avoid, you’re on your way to a great looking door. For some great tips on choosing garage door colors for new doors or existing ones that will work best for your house and improve curb appeal, read on. The easiest pick for a garage door color is one that matches the existing house exterior colors well. This means that your home’s main exterior materials should be considered as the color to match with. For a stone or brick home, choose a door color that is most similar to a dominant color in your masonry. For homes with siding, pick the color that most closely matches the paint on your exterior. Garage doors that blend with the main color of the house tend to make the house look bigger. They also keep the main focus off the garage door. This approach is different from matching your door with window trim or a front door. When you match with these details and smaller aspects, it can give the house a busy look that takes away from its overall appearance. It detracts from other house details and features that should stand out more than garage doors. Keeping your garage door colors as close to the exterior color as possible is also the safest bet if you plan to sell your home in the near future. Sometimes choosing what’s popular is a good way to go. After all, it likely became popular for a good reason! Garage door colors are no exception. If you want a garage door color that looks great and is a good fit for most homes, go for colors that are more popular and time-tested. For solid curb appeal, consider using a popular color that fits well with the rest of your home. Consider your home’s current color palette, architectural style, and building materials when making your decision. Not into subtle or safe when it comes to garage door colors? 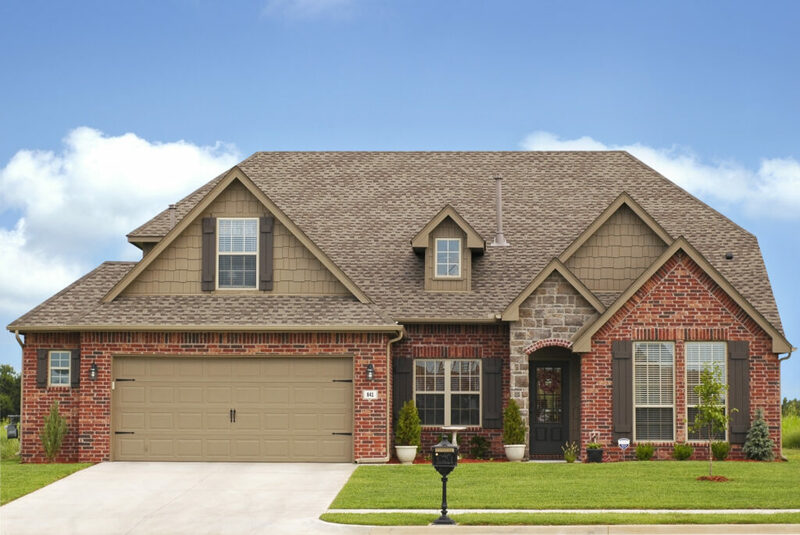 If matching isn’t your goal, consider a color that contrasts with or accents your home’s trim, siding, brick, or stone. Contrasting doesn’t mean picking an off-the-wall color that distracts and makes the house look less attractive. It’s about observing color theory and choosing complements. It means choosing a color that is completely different from the other main colors but is still complementary. Keep in mind that when you choose a contrasting color, it brings attention to your doors. If you like your garage doors and they’re in good shape, this shouldn’t be a problem. You may want colors chosen for your exterior to reflect your individual style. Garage doors can be a nice outlet for your personality. Feel free to try unexpected colors that add visual interest or contrast to your house. While choosing a door color that suits your personality can work, try to keep it simple. Stick with one color for the doors. Unless you have a special door shape that accommodates the look, don’t go two-toned. It’s worth noting that a color choice that’s really bright or unusual might not appeal to the next person who’ll own the house. If you plan to sell your house, a unique or attention-grabbing color may not be the best choice. Sometimes going with the same color on your garage doors as you have on your window trim can work without affecting the look of the house. The best time to go this route is when trim is a light or neutral color. The window trim is usually the same color as other outside architectural elements such as molding and columns. Matching garage doors to the color of these elements work best when they are already a color that contrasts with the main color of the house. It’s generally best to avoid choosing a door color that matches your front door or window shutters. 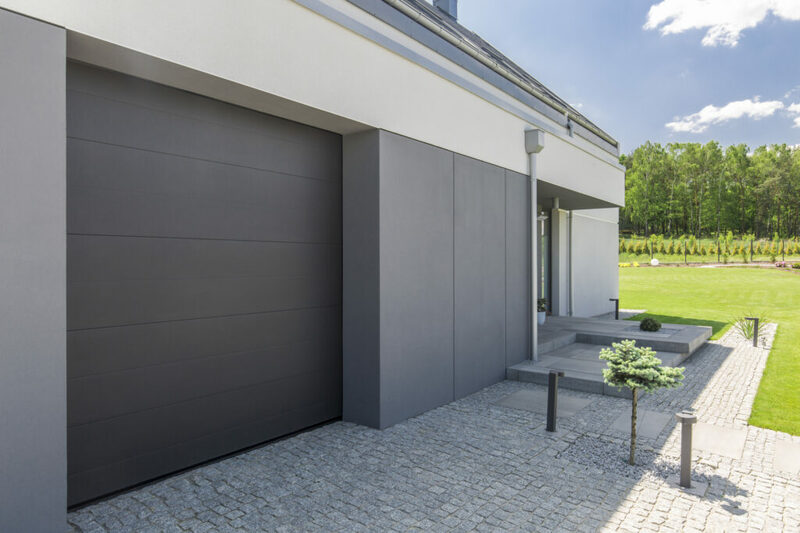 Garage doors are much larger and can take attention away from these points of interest. This gives the front of houses a disjointed look. Avoid painting the trim around the garage doors a different color than the doors. This is distracting and brings too much focus onto the doors. If your garage has panels, textures, or other structure details, do not paint them different colors. Unless your door is older or a specialty door, only one color should be used. If your garage doors face strong morning or evening sun, it’s a good idea to go with lighter colors. Garage doors provide a large surface area for the sun to hit. Dark colors will absorb heat and fade more quickly than lighter, more neutral shades. The right garage door colors can work wonders for a home’s exterior. This can be true with traditional picks and more adventurous choices. Are you in the market for a beautiful new garage door for your home? Contact us today to find out more about our selection and service! Home journalists like Laura Crombie see garage doors as an important part of the appearance of your house. It’s about making the most of limited space, better security, and visual impact. Think about your garage door Arlington Texas, as a statement about your style. Knowing how to maintain a garage door is part of preserving that great curb appeal. There is no point in buying a great garage door if it does not stay in good working order and condition. Read on to learn how to perform maintenance on your garage door. If you have never inspected your garage door, now is the time to do it. Start now and do it on a regular basis. This will save you money in the long run and help you head off any major problems early. The inspection is not a technical task. If you have a metal door check to see if there is any rust. This is likely to show itself with small spots of rust. If there are rust spots clean them and paint them over. If you have a wooden garage door, check for any areas where there has been some damage from damp or water. Seal or paint any affected areas or re-paint the whole door. The garage door works best when in perfect balance. To check the balance, close the door. Pull the emergency release to disconnect the opener. This allows you to operate the door manually. The door is in balance if you can raise the door effortlessly and with no difficulty or resistance. If the door can open to about four feet from the ground and stay there it is fine. If it will not rest in that position, get a professional to adjust the balance. After checking the balance of the door servicing garage door safety devices is your next task. The opener for your garage should have a working reverse feature. This puts a closing door into reverse if any obstruction, such as a child or pet, is in the way. Lay an obstruction such as a brick or plank on the floor in the path of the door. Press the button to shut the door. The door should reverse once it touches the brick or plank. If the door does not reverse, it may need adjustment to reduce the force required to reverse the door. Your user manual will give instructions on how to adjust the sensitivity of the reverse mechanism. If you have any doubt about how to do this seek professional help. This test is vital to carry out after doing any work of the door. Also carry out the test monthly, to ensure safe operation. Regular lubrication is necessary to keep all moving parts working effectively. Oil springs, hinges, rollers, and bearings with a spray lubricant. Lubricate the door opener chain with grease. Now you know how to maintain garage door safety and effectiveness, build it into your monthly routine. You don’t need technical skills. Just do it regularly. It is useful to get professional help on occasion. Ask your garage door installer or a professional repairer for advice about lubricants and any more technical repairs. To learn more about a garage door Arlington Texas, click here. Garage doors are designed to thrive for decades of consistent use. However, this isn’t to say that they’re immune from damage. Deterioration can, and eventually will wreak its havoc on any garage door that’s ever been installed. At some point, your garage door will encounter this deterioration as well. Maybe it’s encountering it right now? Perhaps you’re trying to determine whether or not your garage door needs repair? Here is how to know when you need garage door repair in Arlington, TX. You press the button on your garage door opener, expecting your garage door to fly right open. The only problem is, it’s not flying right open. In fact, it’s taking quite a bit of time to do anything at all. If this is happening to you, your garage door absolutely requires repair. 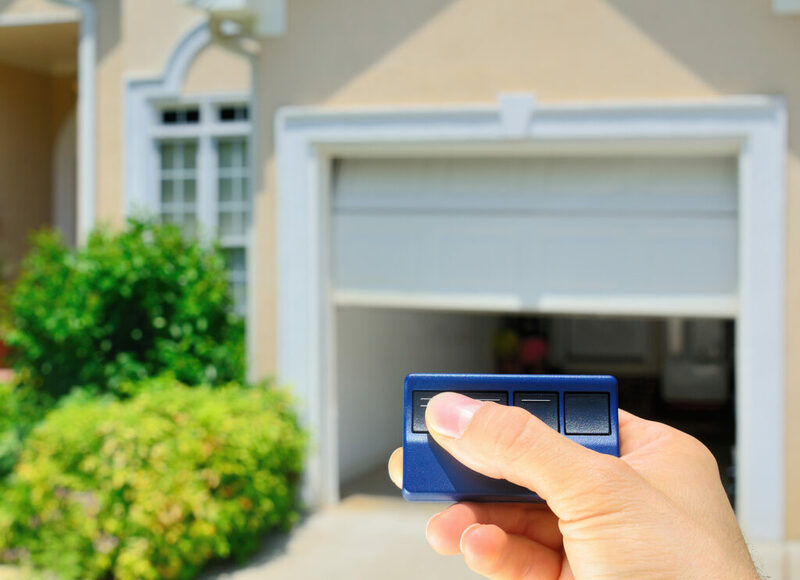 When your garage door is opening slowly, it’s likely suffering from a motor, wiring, or connection problem. Most of the time, these problems can be repaired. However, in some cases, a full opener replacement will be needed. In any case, a professional garage door repair technician will be able to get the job done. Every single garage door in the world makes some amount of noise when it’s being opened up. Often times, this noise can be rather grating, even when the garage door is in good shape. However, some noises made by garage doors are a cause for concern. If your garage door is excessively screechy or squeaky when being opened, it is likely structurally unsound in some way. Garage doors will typically begin to lose some of their structural integrity as the years pass. At the very least, you should bring in a professional repair technician to determine whether or not your garage door is safe and functional. He or she will be able to determine whether or not further repair is needed. Does your garage door look outdated? Perhaps it’s smothered in dents, or has chipped paint? Maybe it just doesn’t fit in with the styles which most garage doors have today? Whatever the case may be, if your garage door’s looks are deteriorating, it could probably stand for some repair. At the very least, you can have it cosmetically touched up; at the very most, you can have it replaced entirely. If your garage door isn’t opening or closing fully, you’re probably well aware of the fact that it requires professional attention. What you might not realize, however, is that this problem typically only requires a repair; not a replacement. Garage doors which don’t open or close fully can have a number problems which are affecting them. Often times, the problem is as simple as there’s something blocking the entrance of the door. Connection issues are also a problem to keep an eye out for. Regardless of the problem, a repair technician will be able to identify and solve it in just a short amount of time. Regardless of the current state of your garage door, it’s going to shake at least a little bit when opening. However, there is a point at which your garage door can shake too much. At this point, you shouldn’t have much trouble understanding that it’s suffering a problem. Excessively shaky garage doors are typically suffering from structural problems. As time passes, garage doors tend to warp, and wheel railings tend to misalign. Allowing a garage door to persist in its shaking is a risky prospect. If you allow it to continue shaking, its problem will only get worse. Instead, call in garage door repair in Arlington, TX. Running along the bottom of any decent garage door is a piece of rubber called weatherstripping. This weatherstripping is in place to prevent water and other debris from leaking through the garage door when it’s closed. While not all weatherstripping suffers the same fate, a great deal of weatherstripping deteriorates far before its counterpart garage door does. Fortunately, it can be rather quickly and easily repaired. A professional repair technician will be able to replace the weatherstripping of your garage door in less than an hour. In order for a garage door to open and close in the way that it’s designed, it needs for its coinciding track to be in good shape. The track contains the garage door’s wheels, ensuring that the garage door folds up appropriately at all times. It is, however, possible for this track to suffer structural damage, especially if it suffers sudden physical trauma. This is why you need to keep an eye out for bends in the track. If you notice bends in the track of your garage door, you should call in a repair technician as soon as possible. Allowing these bends to remain can cause huge problems down the line. The last way to know whether or not your require garage door repair Arlington, TX is if your garage door is sagging into itself. This is something which is typical of old and worn down garage doors. Both wood and metal garage doors can suffer this fate. It often comes about as a result of the foundation of the garage settling. When a garage begins to sag, it’s indicating that it’s structurally unsound. Bringing in a professional repair technician will enable you to pinpoint the source of the problem. After the source of the problem has been identified, the technician will be able to make any necessary repairs or replacements. Has your garage door encountered one of the above problems? Do you require garage door repair in Arlington, TX? If so, our team at Alamo Doors & Gates are the people to see. We’ve been serving the Arlington, Texas area for almost two decades, installing, maintaining, and repairing garage doors all along the way. Need assistance as soon as possible? We offer same-day service.